No, There Is only One God! When I was tak­ing this pic­ture I raised my index and mid­dle fin­ger and parted them ask­ing the gen­tle­men to make peace ges­ture. The senior man in the back shouted, “No, there is only ONE God!” “There are not two Gods”, he added. I almost got into a big trou­ble. They prob­a­bly thought I was try­ing to con­vert them or some­thing. It was in my own city of Jalal­abad but these folks seemed alien. 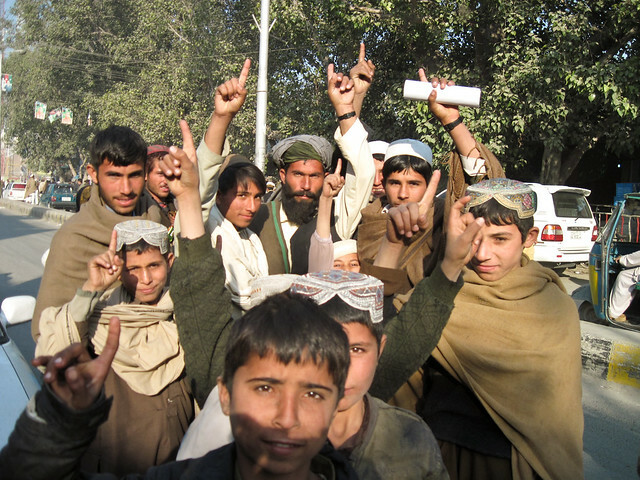 Some peo­ple in Jalal­abad know what the sign means. That’s the prob­lem with these chaps. Une­d­u­cated and out of work, they have noth­ing else to do but become experts in every­thing con­cern­ing God. Rhadaman­thus and Minos, law­givers of Crete, and Lycaon of Arca­dia, had inter­course with Jupiter; Trip­tole­mus of Athens was inspired by Ceres, Pythago­ras and Zaleu­cus, for the Cro­to­ni­ans and Locri­ans, ascribed their insti­tu­tions to Min­erva, Lycur­gus of Sparta acted by direc­tion of Apollo, and Romu­lus and Numa of Rome put them­selves under the guid­ance of Con­sus and the god­dess Ege­ria. The first Chi­nese monarch was called “Fag-Four” — “The Son of Heaven.” Tuesco, the founder of the Ger­man nations, was sent to reduce mankind from their sav­age and bes­tial life to one of order and soci­ety, as appears from his name, which sig­ni­fies the “inter­preter of the gods.” Thor and Odin, the law­givers of the West­ern Goths, laid claim to inspi­ra­tion and to divin­ity, and they have given the names to two of the days of the week.